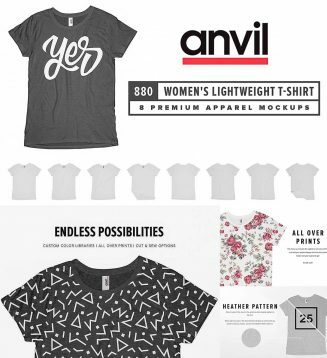 Sell your products with mockups created from a genuine Women’s Lightweight T-Shirt. This set of mockups includes 8 high definition, photo-realistic templates color library including a custom heather pattern. Tags: knitted, knitwear, lady, lightweight, mock-up, realistic, t-shirt, tee, tee mockup, women's.